I am a third year Civil Engineering student at the University of Twente, the Netherlands. As part of our studies, we have to do an internship at a company relevant to our field. I thought this was a good excuse to travel to the other side of the world. My family did not share my enthusiasm but I went anyway. NIWA invited me for a 10 week long internship to develop and apply a methodology for high river flow estimation under El Niño Southern Oscillation (ENSO), Interdecadal Pacific Oscillation (IPO) and climate change under the supervision of Roddy Henderson. After some research on the internet I found out that NIWA is actually a rather big company. I was expecting that a company of this size would have a formal interaction culture. However, this was not the case. I could just walk into the office of my supervisor to ask any question. He would always have time to answer my questions or discuss some results. When my supervisor did not know the answer to a question, he would send me to one of his colleagues. I could simply enter their office as well, introduce myself and then ask my question. Everyone had time for me; it was a really nice working environment. The informal working environment resulted in me telling about my weekend, what parties I visited and what trips I undertook to my colleagues and supervisor. This was all received by them with a lot of enthusiasm and interest. It was not like what I expected when I started planning this internship. Predicting high flows and flooding in catchments relies on historical runoff data. A stationary climate, one where there are fluctuations but no long-term trend, is assumed when calculating, for example, the 100-year return period floods. However, changes in climate can distort these calculated high flow events. This may cause errors within the assumed level of security against floods. This is the reason why I studied the effects of ENSO, IPO and climate change on the high flows in New Zealand rivers. The figure below is an example of my work. 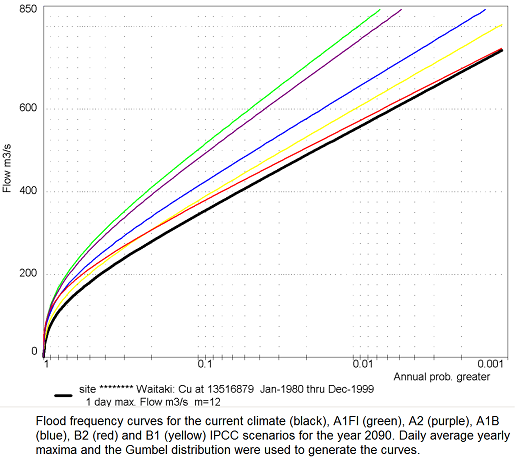 Flood frequency curves for the Ahuriri River are plotted for different scenarios of climate change in 2090. As you can see, floods are generally expected to become more extreme. The most important conclusions from my work were that a lot of catchments in New Zealand are affected by the IPO and ENSO phenomena and 20 years of flow data is not enough time to discern the effects of climate change. I really enjoyed working here and I hope I can visit this beautiful country another time, preferably summertime.